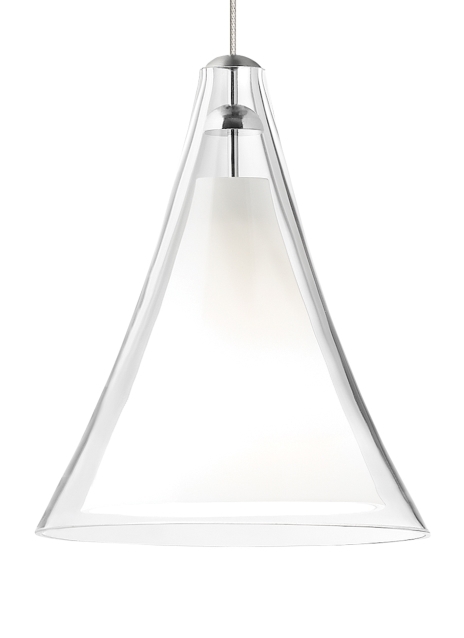 The Mini Melrose II pendant light from Tech Lighting features a graceful shape and conical inner diffuser. This modestly sized contemporary pendant boasts an artisanal crafted shade that adds dramatic impact without assertive size. To further compliment this contemporary styled pendant are three on trend color options along with three hardware finishes. Scaling at 5.8” in length and 4.9” in diameter this pendant is ideal for kitchen island task lighting, bedroom lighting flanking an end table and home office lighting. The Mini Melrose II ships with your choice of halogen or LED lamping, both options are fully dimmable to create the desired ambiance for your special space. Includes low-voltage, 35 watt halogen bi-pin lamp or 8 watt, 300 delivered lumen, 3000K replaceable LED SORAA® module and six feet of field-cuttable cable. Dimmable with low-voltage electronic or magnetic dimmer (based on the transformer).